The wicked witch from fairy tales or a goddess in disguise? We have as much, and sometimes more, to learn from our tormentors as we do from our teachers. Baba Yaga is one who teaches through fear. 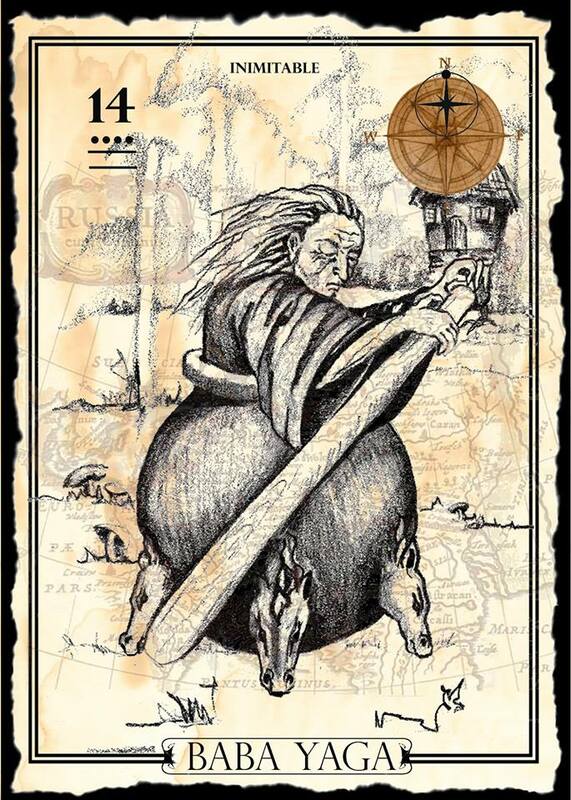 Baba Yaga is a slavic Witch/Goddess. She turns up in many fairy tales, always a rather scary character. She is a Goddess that strips away all the crap and gets right down to the bones of a situation. She reminds us of the need for a strong foundation. A foundation that is solid, not littered with fears and illusions.Hers is not a fun energy to live in. Baba Yaga teaches us that we cannot pretend. We cannot pretend that everything is okay when it is not. We cannot pretend that we are someone we are not. It is easy to get caught up in distractions and illusion. They are what keep us from facing often painful realities. Baba Yaga will strip that all away. She teaches us that the only way to happiness and peace is through honesty. She will be painfully honest in assessing your situation, she will not mince words. She doesn’t care. She has no time for sugarcoating, she will not enable. She demands that you step up and be accountable, be responsible for your choices and your decisions or she will not allow you to go further. You will never leave her bone yard alive. The choice is enlightenment or death. She will trick you, twist you and test you. It’s only painful if you fight. Surrender to the honesty, let the illusions fall away. Rip off the proverbial band-aid, it will make it a whole lot easier. You are in a small clearing in a birchwood forest. There is a large rock near a path through the trees. Here you sit and remove your shoes. With a deep breath you stand and begin to walk in bare feet at night. The Moon grows cold. You look up at the waning crescent, up to Her light and Her gleaming white fingers point the way for you to follow. Mesmerized you follow Her gaze deep into the forest and begin to walk the bone littered path. You chose your steps carefully to avoid the sharpness of potentially splintered bones, rocks and twigs. You take deep slow breaths inhaling the crisp fall air. You smell autumn on the breeze, dying leaves and cold earth. You steady your heart and focus on your breath, slowing your thoughts. You begin to hear a rhythmic pounding, somewhat muffled by the trees. At first you think it’s your heart, but you realize it is the sound of pestle in mortar. It’s beat is steady and you match your own body’s rhythm to its sound. As you near a clearing that is just around the next bend, the pounding grows louder and you feel an icy breath on the wind. “Grandmother, I come before you, clothed and afraid, not knowing if I will be allowed to leave. And in your horrible gaze, may you find me worthy. And with your horrible teeth may you tear away my flesh, leaving nothing behind but my bones. My bones, as gleaming white as the moon. The moon, with her thin fingers that sooth my tears and smooth my hair. As she assesses you and your situation, you wait quietly, you do not speak. She may give you words of advice, she may send you on your way, she may give you a gift to take with you. Whatever Her response, thank her and move away quietly back through the woods. Continue to breathe the crisp autumn air as you walk slowly back down the path. The moon will guide your way. Once you have returned to the rock, replace your shoes which you left behind and begin to move slowly back into your own space, your own body. Remember that Baba works in ways we cannot question, in ways we cannot fathom. She often gives you a gift that you may initially see as a curse, look closer. Enlightenment will come if you allow it. I recently had the pleasure of joining my husband, Ted Jauw of Surcadia and my dear friend Beth, of the Orange Moon Tea Society in providing teas and entertainment for Madam Aubergine’s Mystical Tea Party. The party was a benefit for Lush Lapels charity, Blushing Violet. The party was held at the Ladies Literary Club in Ypsilanti, MI. The club is housed in a building built in the mid 1800’s. It was full of history and the guests were not all living, and not all invited. 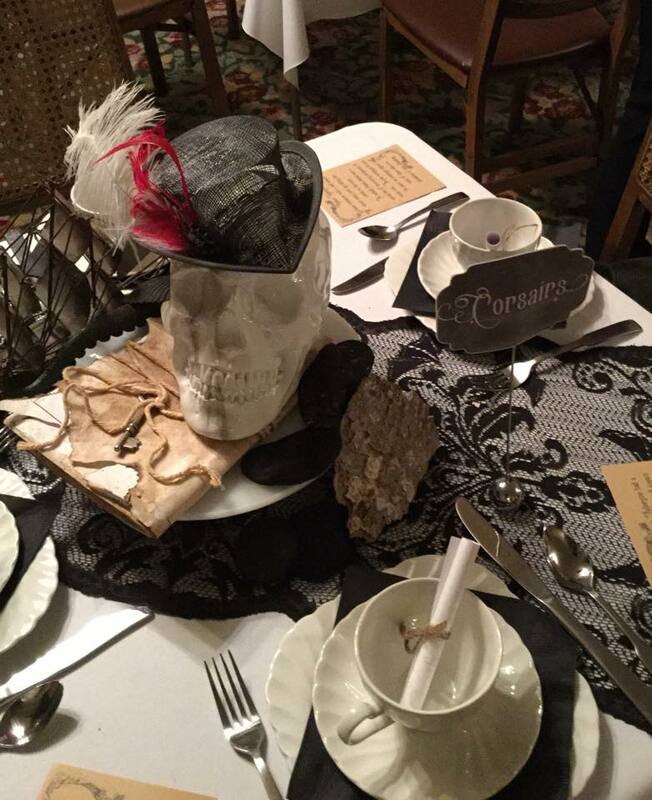 It provided the perfect atmosphere for spooky stories and some tea leaf readings. Unfortunetly, one of the not so alive but rather ‘lively’ attendees was not pleased that I was reading the leaves. It was my first experience of a spirit being able to affect me physically. I was scratched to the point that it drew a bit of blood. Fortunetly, my husband who HAS delt with such things stepped into sheild, we shifted gears and went on about our evening in a great way. I have to say I was embarrassed that I was unable to concentrate and lost a bit of my ‘professionalism’ initially. Glad to have regained control. It is strange to be experiencing something that no one else can see and hearing things that no one else can hear. Although many did experince the sense of a presence and some were touched on the shoulder. We do love tea parties!! AND the guests, well, most of them. Afterall, it is the season! 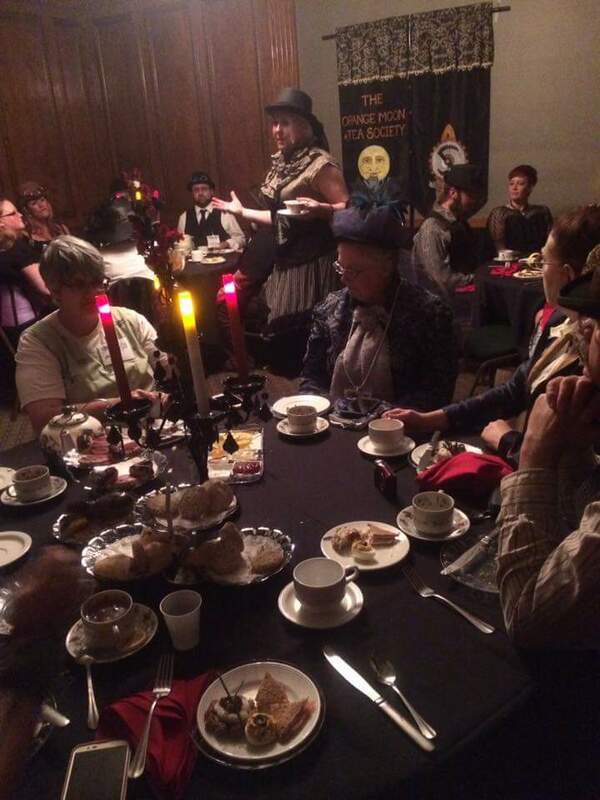 Last weekend was our Orange Moon Tea Society’s first event at a Steampunk Convention. We had an amazing time hosting their Occult Tea, Sponsoring their tea room, giving tealeaf readings and selling our wares. I was able to go with my two youngest beans and my husband. We had a wonderful time. This weekend I hope to catch up a bit and make preparations for NEXT weekend where we travel to Yoga Fest in Northern Michigan. More tea in the making! As I’ve been working on the companion book to the Surcadian Oracle, I have been writing some guided meditations as ways to make contact with each goddess. Amaterasu represents a very Firey Sun Goddess and her meditation turned out to be much sexier than I thought going in. But I went with it nonetheless. It’ll be interesting to see what edits happen before making it into the book…In the meantime, here is the card, the excerpt from the book and the meditation for you! Amaterasu is a Japanese Goddess of the Sun. There are multiple stories written in about Her. In one of them it describes Her arguing with her brother. Because of this terrible argument, She chooses to hide in a cave, a result of Her anger and grief. It was Uzume, a goddess of laughter and joy, who was finally able to lure Her out of Her cave and out of Her depression. Uzume was known for her dancing and comedic antics. It was precisely these things that enticed Amaterasu to venture out. When She emerged from the cave, She saw Her reflection in a large mirror that was placed in front and She was momentarily distracted by Her own beauty and love allowing Her to be drawn out further and never return to the darkness. Amaterasu allows us to acknowledge our dark periods. Those times of grief and depression. Sometimes it is necessary to go into our caves to heal. What Uzume shows us is that we cannot stay there forever. If the healing turns to self-pity and becomes an addiction sometimes it takes another to be a mirror to us and show us our true selves. As a mirror we can be shown the true beauty of who we are and not the darkness that we may have become. When Amaterasu steps in, you are being asked to bring more joy into your life. Examine your shadows and where you might be stuck. Take a look again at who you are in a brighter light. Now is the time to come out of your cave and to begin life anew. Go ahead, laugh at yourself, allow joy, close your eyes and feel the warmth of the sun. And remember that sometimes you are the light and sometimes, you are the mirror. Reflect love. You rise and dress comfortably putting on a light jacket. You look around your room packing some items in your backpack and preparing for the journey ahead. The day is cloudy and it looks as if a storm might be­ brewing but you are not concerned. A brisk wind stings your face as you open the door to venture out. Your first clue that this will not be an ordinary journey. The ground is springy beneath your feet and the grass here is quite green and soft. You set off in the direction of the mountain in the distance. You feel full of energy and optimism. But as you walk you notice that your chest gets heavy. The air becomes thinner and it becomes more difficult to breathe. Your pace slows as the ground becomes uneven and rocky. Your pack begins to weigh heavily on your back as the terrain steadily inclines. You begin to lean forward to counter the weight. As your ascent continues, your descent into yourself begins. You begin to question why you chose this journey. You lament all the decisions you have made in preparation. Why didn’t you chose a warmer coat? Why did you pack such a heavy bag? Why didn’t you wear better shoes? You should have known. You should have known. You should have known. The sky grows darker. You continue to move forward but you are tired now. Your breath comes in ragged gasps. You cough and you trip on slippery ground. You catch yourself with your hands, cutting them on the sharp gravel. You wince with pain noticing the tiny drops of blood pushing up through your skin. You think you cannot go on when the rain begins to fall. Your head swims with thoughts of “what if?”. You curse yourself for not being good enough, for not being strong enough, for not having what it takes to reach the top. You decide you were never going to make it anyway so you may as well quit now. It is then that you notice a cave in the hillside. You decide to rest there until the rain passes. You sit for some time in the entrance of the cave listening to the storm and watching the rain as it falls heavily upon the ground. You are wet and cold and alone. Shivering, you turn toward the tunnel leading into the earth and decide to venture into its depths. Your despair becomes overwhelming. You no longer care and you wish to disappear. You gather up your pack and begin to walk into the darkness. You smell the fire before anything else. The smoke from burning wood peaks your curiosity. You move forward, deeper into the depths of the cave. You begin to hear the crackling as it burns and then begin to feel its heat. A tiny spark floats in your direction, beckoning you toward the warmth. As you round the bend, it comes into view. The cave is filled with light. There are soft piles of blankets on the ground and a plate of warm food. Then you notice Her. She sits with the hot golden glow of the fire on her skin as it burns between you. Her face is twisted in pleasure and beauty. Sweat sparkles like diamonds on her skin. You briefly wonder what it is you walked into and contemplate a quick and embarrassed exit. But you stand there unable to move in her presence, wondering what it is that compels you to stay. She motions for you to remove your wet, cold clothing and to sit. You drop your pack, disrobe and you take your place upon the soft blankets. The warmth of the fire relaxes you and pulls you into a sensual embrace. Her unreal beauty mesmerizes you and you continue to stare unblinking. Your fingers absently touch the fabric of the blankets, mindlessly noticing their otherworldly softness when you suddenly realize it is in fact, your own skin that you are stroking. She laughs at your shock and discomfort. You can’t help but laugh at yourself too. She stands and walks toward you. You lick your lips in anticipation and your heart beats faster. You don’t understand what it is you are feeling, but you no longer care. Taking Her place beside you, She picks up your pack and throws it in the fire. It crackles and burns clean away. She scoops up your clothing and burns it in the fire. It too dissolves in the heat of the flame. Naked and exposed, you lose your desire to hide. She picks up the food, one morsel at a time and pushes it gently into your mouth. It melts like magic over your tongue in an indescribable taste explosion. You feel it vibrate through your entire body. As she feeds you, she tells you her story. She speaks of a grief so deep and unending that it takes your breath away and cuts deep into your heart. You feel the knife of her pain cutting into you, carving away pieces until a deep, empty chasm is all that remains. Then she kisses your heart and you feel it soften. She kisses your belly and you begin to feel your own inner fire. She kisses your pelvis and you feel pleasure that is akin to pain. She stands to kiss the top of your head, pulling all of these sensations through your being. Filling the cavernous space that she carved. Lastly, She picks up a mirror and slowly turns it toward you. For the first time you are able to pull your eyes away from Her and look at your own reflection within. And there you are with skin the color of the golden flames, sweat sparkling like diamonds in the firelight. There is laughter in your eyes and love in your heart. And there is light. A light so big and blinding that you know you will never totally give into the darkness again. She laughs as you gasp in surprise at who you have become. She laughs as the light flashes, blowing you back from the flame and blocking out all sight as you lose consciousness. You slowly wake to find that you are resting outside of your door on the soft grassy earth where you had taken the first steps of your journey. You are not sure of the time or how long you’ve been gone. As your eyes adjust to the rising of the sun, you laugh at Her shining down upon your new day. I’ve enjoyed reading tea leaves for years now. It reminds me of those summer days when I would lie in the grass, stare at the sky and find pictures in the clouds. This little book I put together so others can experiment and have fun with this as well. Each chapter begins with a block print that I created specifically for this book and the book ends with several recipes so that you can try your hand at making your own blends. 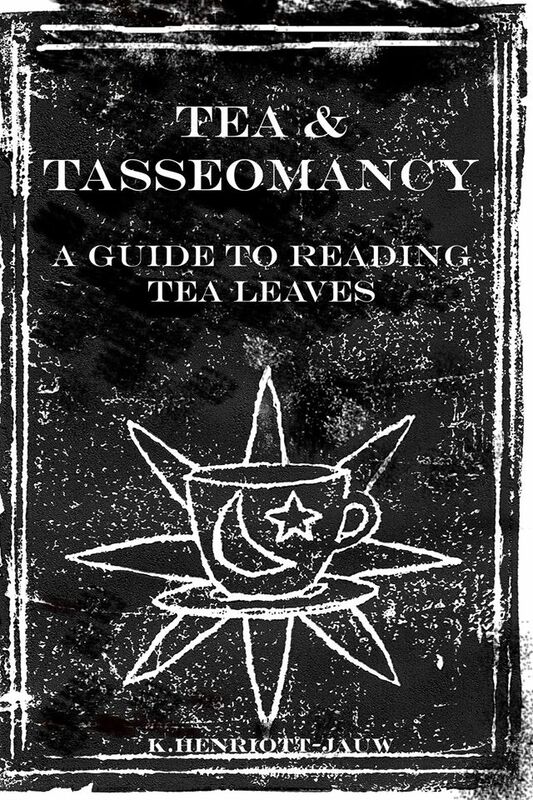 You can find it here: Tea and Tasseomancy. Yesterday I had surgery on my ankle. They removed all the screws and plates and various hardware that was implanted last year after I broke it. The breaking of that ankle seemed the marker for the beginning of a personal journey. Everything I believed was tested. Nearly everything I feared, I faced. 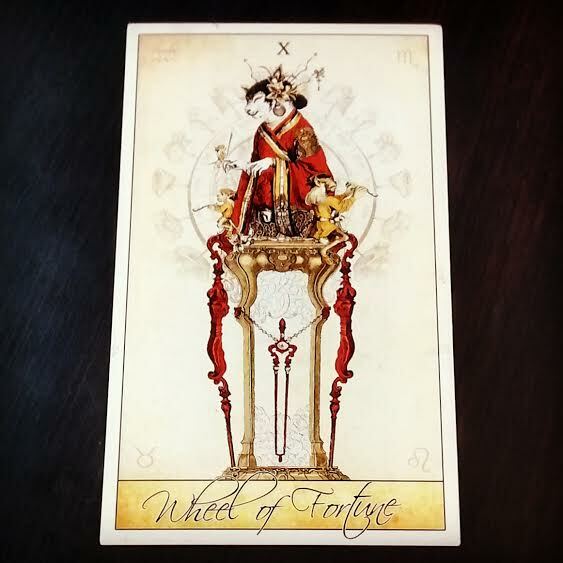 The Wheel of Fortune in the Tarot, very much sums up the cycle that I’ve been living. Of course everything in life is cyclical, not linear, as so many believe. The trick to a circular life is that when you come around to that starting point again, you are hopefully wiser, braver and stronger so you can choose differently and begin a new and better cycle. Last year not only did I break my ankle, but because of that I lost several jobs and income we were counting on to be able to move. Not being able to walk or move around without crutches and pain made it necessary to call on many friends to help us pack. And then to move. Most of our things went into storage, much of it we had to leave behind. Some friends agreed to let us stay with them for a period of time. When that time was up, we still were unable to find anything. We stayed on the road and in hotels until we landed with some more friends. Our time here is nearly up and although we don’t have anywhere as of yet to go, we are very, very close. I had been exploring and releasing this whole poverty consciousness within me for some time but this journey brought so much into VERY sharp focus. First thing is the immense gratitude I feel toward all my friends. From kind words, to new shoes, to dinners out to packing, moving, even letting us crash in on them dog and all! It’s huge. The power of community is huge. I am forever grateful for my community. I learned how little I cared about things as I had to leave them behind. People matter, not things. I always believed that but there is a completely different feeling that was added to that belief once it was lived. I realize I don’t have time to screw around anymore and not follow whole heartedly my dreams. As hard as we worked, taking any job we could, accepting stop gap measures, we ended up homeless anyway. It’s easy to react in fear and only look at short term solutions even when that means we get screwed over long term. Not anymore. I see how I can push even harder when I thought I was at my limit. We all have a little more to give. Sometimes we just need to find the right motivation. At the same time, I learned that I need to push less and be gentle with myself, allow others to step up so they can learn their strength too. Communication and respect have always been important to me, but living in someone else’s space made me hyper aware of what was around me, how I was living, how I was contributing or detracting from the situation. It also allowed me to understand the victim/rescuer paradigm in a close up and personal way. I do not like being considered a victim. I see now how I have allowed that to happen by allowing particular treatment. No more. Speaking up, setting boundaries, adjusting attitudes…there have been many sleepless nights, so much examination of myself. I see how spirit can move us to one place and another not only for what we can learn, but for what others can as well. None of us live in a vacuum. So much good can come of it if it is allowed. We started off losing quite a lot. I gained some screws (in my ankle) and I felt screwed (by life). Now those screws have been removed. The cycle is completing. My ankle is healing, there is money in the bank, we are ready to go as soon as the opportunity presents. The Wheel of Fortune seems to be turning around, but this time I am wiser, braver and stronger. This time my decisions will be based on my new experiences and will move us forward on a better journey, and finally, a better turn of the wheel. Ah the weekend. One day, I will have one that is completely open and I am free to relax. Until then I will stay focused. At least until the evening. I figure putting nine hours in on a Saturday is good enough. (The nine hours thing added for your benefit so you will not judge me, or maybe feel sorry for me? Nah, more so I can rationalize to myself and ease my guilt and impulse to keep working until I drop.) The thought crossed my mind to give myself a reading, which caused me to recall this page and the fact that I haven’t posted in awhile. The dangerous thing about posting here, is that I’m not even sure anyone sees it. Which makes me feel safer to say things that perhaps, otherwise I might not say. Here I lay down my art, my musings and my adventures. My opinions, observations and my rambles may end up here too. Tonight is a case in point for the ramblings. I’ve been working hard to stay focused and finish up many projects. The largest one is our ArtPrize entry, The Blue Bead Project. I’m also on the finishing side of illustrating a children’s book. One that I happen to think is VERY cool. And I will post more about that as soon as I can. I will also be wrapping up a triptych for a local church and need to start a faux finish for another installation for another local church. All this while teaching part time, developing new teas for the amazing Orangemoon Tea Company and looking for a place to live. 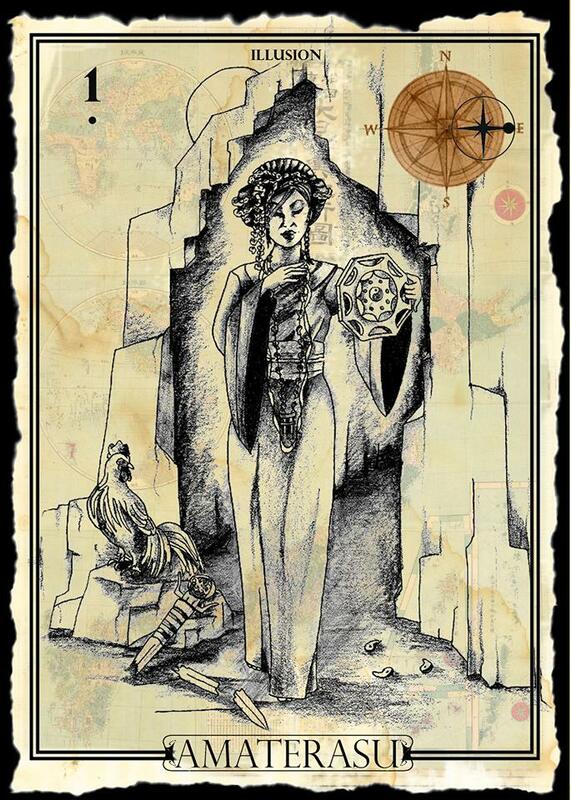 And as I began this post with the idea of pulling a card for myself, I have decided to do just that. 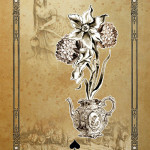 I chose to play with the Orange Moon Trading Company’s Bat Lenormand Deck and pulled number 27. 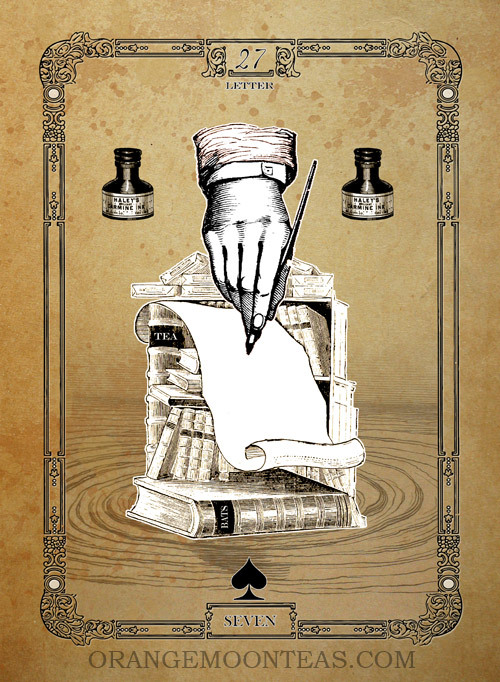 This card has to do with communication, documents, messages, etc. The first thing I thought of was that in this day of instant messaging, the picture depicts a hand written letter, sent via snail mail I’m sure. And although it is beautiful, it made me think of delays. I believe my patience will be further tested. What may be a good lesson for all of us with this card is to think about the messages we convey in our everyday lives. How are we living? What is our attitude? Is our message clear? Is it forward moving and of benefit to ourselves and others? Or do we continue with a victim mentality and carry anger, hurt, blame or even guilt? Maybe writing out our feelings (like this lovely rambling post here), journaling or even writing our story could help. Perhaps this has to do with paperwork of a business nature, tying up lose ends, finishing what we’ve started. This card could also be speaking of getting all your ducks in a row. Make sure you are doing your work, covering all your bases, and various other cliches. But I think the main point is to stay focused. Stay honest. Be clear in your communication. Expect some delays but ultimately, if your message is on point, you will achieve that which you set out to achieve. And now I believe I shall return to my family, wine, chocolate…or maybe some popcorn. Because coping skills are important, I think I will pop some, curl up with my kiddos and watch a movie. The fact that there are more people enslaved today than during the last 400 years combined is mind blowing to me. Many of these modern day slaves are women and children. I have daughters. I cannot imagine any of my children being taken into the slave trade. How horrifying this must be. So often I think to myself, what difference can I make? I feel so insignificant. How can one person change anything so awful in this world? I’m not famous, I’m not a politician, I’m not a billionaire. I’m an artist. Art is my life, art is my tool, art is my voice. So I am using my art to speak out. After all they say a picture is worth a thousand words. So how many words is a large installation worth? Hopefully a whole lot more. 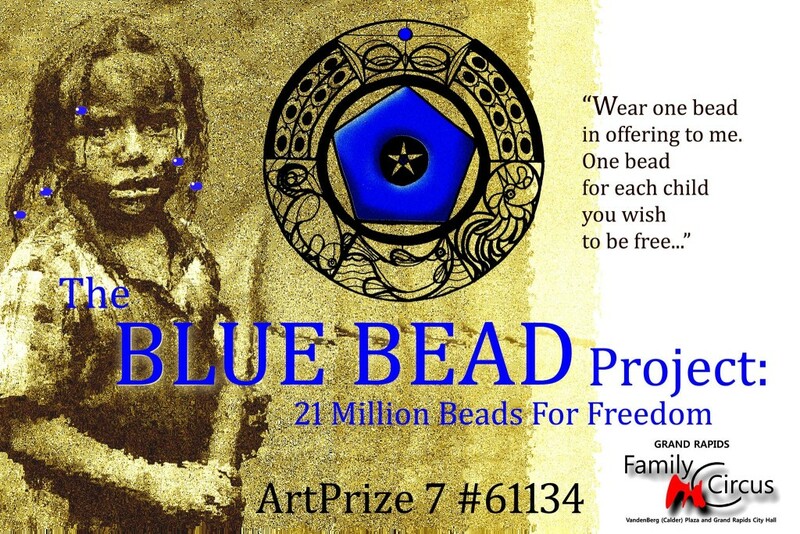 The Blue Bead Project is an ArtPrize installation designed to bring awareness to modern day slavery. And I need your help. And it’s really easy…just wear a bead. Why a bead? Please check out our Facebook Page or our Website to learn more. If you want to help even more, please look into our Campaign. I know one voice may not sound like much, but a chorus will be heard above the greed horror of human commerce. I know that with all of us, we CAN make a difference. Today has been one of those frustrating days where I have found myself loudly complaining about all of life’s injustices. It can sometimes feel good in the moment to be able to vent but it seems an awful waste of energy if that’s all it’s accomplishing. I realized I hadn’t thrown down some stones in awhile so I decided to do that prior to going off on another unproductive rampage. I’m doing a quick cast today. Tossing 4 then pulling the fifth stone last. Three of my four stones were face down. The one that was facing up was Bau. That’s the little one that looks like a bird. He represents divine intervention. Because it was face up, it is something that I am consciously aware of, which is true. I have been feeling alot of divine intervention lately. Its always comforting to know you have spirits, ancestors, your creator, the universe, god or what ever you call it, who have your back so to speak. This means that things are in the works in the spirit world. It hasn’t been yet made manifest but it is quite active on the “otherside”. This I could feel, so I was more interested in the stones that were face down. These represent those things I am not aware of, or don’t want to see but need to. 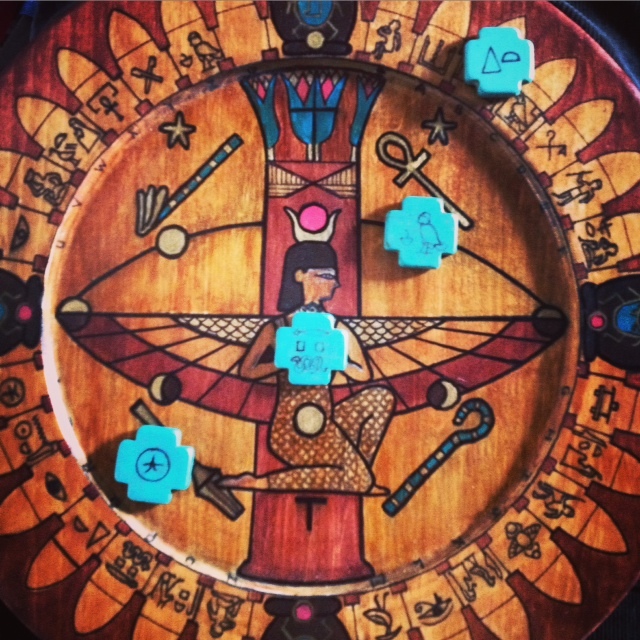 The first in the SW Quadrant, the place of money and material things is duat. This star-like symbol is the glyph for the underworld. This is about a journey. This is showing me that there is some reason that I am needing to travel through these trials and tribulations. There is a reason why I am being tested when it comes to finances right now. It is my journey. I need to cross gates here. I need to learn, fight my fears and move on. The good thing about this journey is that at the end of it is “heaven” or even reincarnation. That feels more accurate to me, a rebirth is about to happen. Sometimes it’s nice to be reminded that there is a reason for going through the things we do. Sometimes it is necessary to be reminded that perhaps a change in mindset is in order. This is my opportunity to learn and grow. This journey has a good outcome as long as I keep paddling. The next stone is over the area of my board that represents the 3rd chakra and the place of will. This stone represents obsession. Often I look at this stone negatively. I think of obsession as a bad thing. However, being over the Solar Plexis, my intuition say that in this case it is necessary. It is about my willpower, my ability to focus, my ability to follow through, to keep going, to make things happen long after others would have given up. Sometimes our dreams need to become obsessions. We need to work them tirelessly to accomplish what needs to be done. In this case, because the stone was upside down, it is telling me to bump it up here. I need to be even more intense, more focused, more determined. It will take all of my willpower. The last stone represents hope. It fell over the place where Isis sits on the outer ring of the board. These are energies working just outside of me. There is magic happening around me. Things are working around me to move and shift into place what needs to be done to get me to where I need to be. It is as if the prayers and hopes of all of those around me are working on my behalf as well. I should not ever doubt the power in that. Ah, my last stone that I pulled was the hieroglyph for the god Shu. He represents strength. My outcome from this adventure I am on is that I will develop a new and deeper kind of power and strength. This type of strength is in knowing and accepting who I am, what I want, how I express myself. It is confidence, swagger, comfort in my skin. Here also, it is representing physical strength. Heart, mind and body need to come together now. It’s time and all the forces are moving me towards that. As with all change it is uncomfortable, to say the least! But the reading reminds me that at the journeys end I will find peace and good things awaiting me.